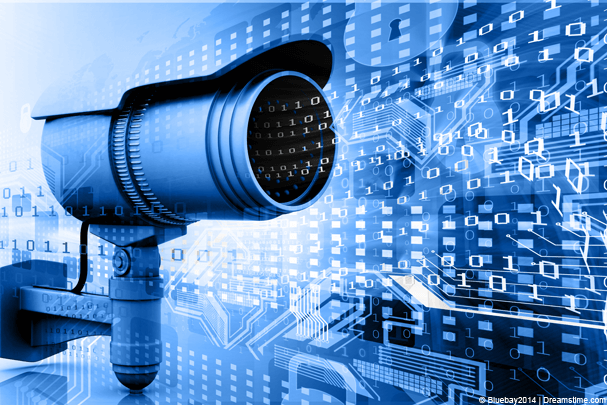 In a recent survey carried out by website Broadband Genie results show that VPN use in the United Kingdom would dramatically increase should the IPBill pass and become law. The Investigatory Powers Bill (IPBill) or Snooper’s Charter as it is often referred to is a bill currently under consideration attempting to be fast tracked through parliament that would amongst other things require ISPs to record and store the URL of every website visited by every citizen in the country for up to 12 months. The privacy implications to this are so huge that digital rights organisation such as the Open Rights Group and others have been campaigning hard against the draft bill. In the survey carried out by Broadband Genie, it found that out of the respondents only 13% of UK citizens currently make use of a VPN service. 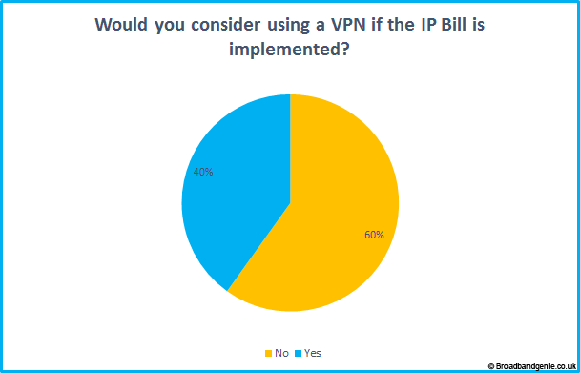 Of those surveyed who don’t currently use a VPN service a further 40% would consider using one should the IPBill become law. This is quite a staggering amount when you consider that 43% of respondents to the initial question of if they currently use a VPN answered “I don’t know” making it clear that while VPN awareness is growing there is still nearly half of the internet population unaware of what a VPN actually is. Using a VPN service if the IPBill was introduced would essentially stop ISPs from logging the URLs that a user visits because the connection is encrypted to a third party server located elsewhere. Even in the highly unlikely event that UK VPN servers were required to somehow join this logging free for all it would be just as simple to connect to a server located in another jurisdiction. With the current 13% of VPN use in the UK and a possible 40% of users who don’t currently use one, it paints a bleak picture for the success of the invasive Investigatory Powers Bill. Furthermore, if the law was passed and average users became more aware of ways to mitigate against the logging it is highly likely that the term VPN would become as well known as the phrase “to Google” leading to an even greater uptake. As news of the IPBill spreads Broadband Genie found that interest in VPN services is already on the increase. 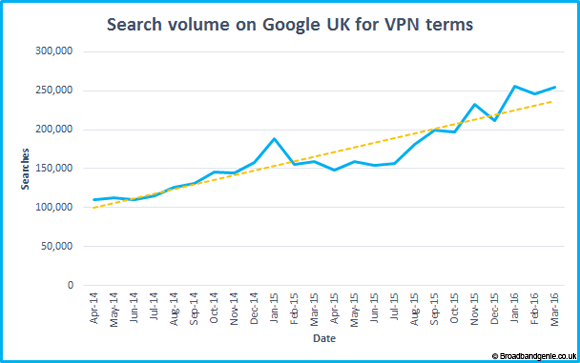 Comparing Google UK search terms for “VPN” between Q1 2015 and Q1 2016 found there has been a massive 25% increase in searches related to the privacy tool. A steady and gradual increase in interest has been witnessed every month from April 2014 until March 2016. Noted spikes in November 2015 and January 2016 around the times of IPBill announcements can clearly be seen. If you’re interested in staying one step ahead of government surveillance then a VPN service from our VPN Comparison Guide is a good place to start. If you want to learn more about what a VPN is and how to choose your first VPN service then see our Beginner’s Guide.